Customer returns are an inevitable part of the sales process. While it can be a very cumbersome and less than desirable aspect of your business, the extent to which your company successfully manages the return process will leave customers with a lasting impression on your business that can impact future sales. Recent statistics show 97% of all consumers consider the product return process important to whether they shop with a business again. 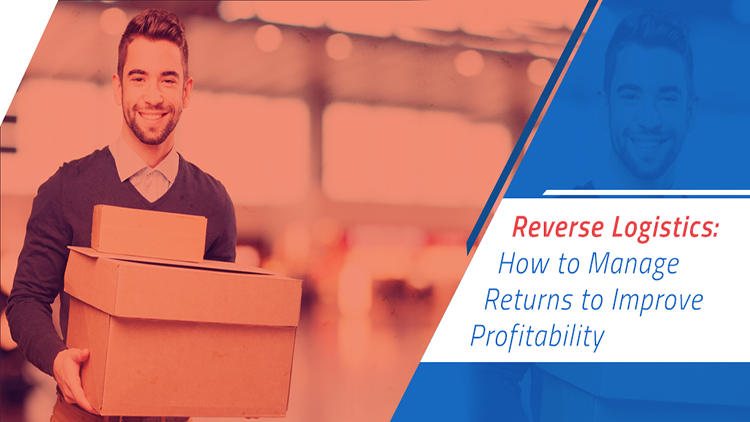 The previous thought process for returns was to make it more difficult for customers, thereby potentially lowering overall returns. However, this couldn’t be further from the truth today. In fact, customer returns should be relatively easy process without complicated steps so that customers will become brand advocates instead of social media nightmares. Reverse logistics can be defined as activities taking place in the sales process for a product after the product is sold and delivered to the customer. Reverse logistics, or customer returns, can include the process of identifying and validating returns with customers, coordinating return shipment to your returns processing department, shipping additional products or parts to the customer, receiving and processing the returned goods, and properly re-classifying and forwarding returned merchandise back to inventory or to other areas if applicable (such as “to be refurbished” or “to be disposed of”). The whole point of it is to create a more efficient aftermarket activity so you end up minimizing cost, maximizing efficiency of the process, and “winning” the customer back throughout the process. There are a number of things that can initiate a customer return. Some of these are ‘quality control’ related, while others are specific to the customer. With regard to ‘quality control’ related items, the most common returns are a result of either mis-shipments or defective products. In the case of a mis-shipment, the return results from the fulfillment department (or fulfillment services company if you outsource) sending out the wrong product. In cases of defective products, either the entire product is defective or a part of the product isn’t working properly, each of which might result in a different course of action for the returns process. When it comes to the customer, there are a number of ways in which a return can be initiated. First, the product may not fit – requiring another size, etc. Second, the customer may determine that the product didn’t meet their needs. Third, the customer may decide that he or she doesn’t actually want it. Finally, there may not be a reason at all – they just may simply wish to return it. Now that we’ve outlined what returns are and what causes them, we can more effectively outline ways in which you can improve your overall process. Often neglected in the returns process are pre-sales functions that can be used to reduce the risk of returns. With regard to mis-shipments, improving picking and packing procedures can go a long way in terms of reducing errors. Technological advances within the modern-day warehouse have enabled even smaller companies to utilize sophisticated technology to scan, pick and ship products and virtually eliminate errors. If these technologies are outside of your reach, perhaps it’s time to think about outsourcing the process to a professional third party fulfilment center. In terms of customer related returns, companies should do everything possible to adequately show the product in multiple formats online so that customers can truly “touch and feel” the product. Adding photos, thoroughly describing sizes, and even adding video of products will help consumers better understand the product and can have a positive impact on returns. Regardless of the time and effort put into reducing returns, there will be no way of avoiding them – so creating and executing on a returns process strategic plan will help ensure the process is handled the best way possible. In fact, creating a plan is the first and one of the most overlooked steps in the process. Spend some time with the relevant departments, including the warehouse, finance, and customer service, to determine the different touch points and necessary steps in the process. By creating and documenting the overall plan, every team member can be “on the same page”. The overall goal should be to make the returns process easy for customers. This process starts with an intentional process with the goal of responding quickly to the customer. Companies oftentimes use RMAs, return merchandise authorizations to help process returns during a product's warranty period. The intention is to gather information on the return for metrics on preventing problems in the future. All of this occurs through information capture and validation, which can become a lengthy and complex process. Once granted an RMA, the customer can send the product back to the relevant return location for processing. In order to make the return shipment fast and painless, more and more companies are including prepaid labels in the initial shipment. Sometimes, the returns process can be avoided by simply offering a discount to a dissatisfied customer to give them an incentive to keep the product. Furthermore, replacement parts can be sent with the intention of allowing the customer to use the product after replacing the defective part. If the product is returned, it will then be up to the returns processing department to access the condition of the product. Some product will need to be refurbished before returned to inventory, some product will be able to be returned to inventory immediately, and some will have to be disposed of completely (either (sale of bulk stock at discount or disposal). All of these steps should be outlined and processes determined in order to maximize efficiency. For example, the speed with which your company can return the product back to inventory and sell it again will help with the profitability of the entire process. In many case, outsourcing can the returns process can be an effective way to manage returns. Fulfillment centers specialize in handling shipments and returns. One thing to consider, however, is the fulfillment company’s capability with your specific product, and whether or not they have refurbishment capabilities. Additional training may be necessary to properly prepare the center for your specific product.